This unique and innovative approach to Vehicle diagnostics uses a combination of cutting edge wireless technologies to deliver a FULLY INTEGRATED - Pro-active fleet diagnostics service. Vidiwave use a blend of Enterprise Class 3G and WLAN via its own secure VPN to deliver ALL your fleet diagnostics in ONE solution. This high level of integration using mobile networks, streamlined hardware and hi-end Remote Management Services allows Vidiwave to deliver a fully tailored diagnostics solution to both Automotive and Rail clients. Reducing their operational overheads from a multi-network / multi-vendor model to single hi-technology solution that not only lowers running costs it also significantly reduces on-going service costs by delivering early diagnostics. Very low running costs - Our solution uses standard Public APN SIM cards not the Hi-cost Private APN Fixed IP Address SIM cards. This means that our monthly fixed costs are up to 60% less than Private APN solutions and our daily data usage costs are even lower. So now you can have it all for less money than you are paying for a standard fleet tracking solution. Plus we can add real-time video to the tracking as a "nice to have" option. Can you really afford not to take a look at this solution? Full GPS Tracking and Location Services. Tachograph Driver alerts and remote analysis. Driver Monitoring and Retraining Routines - to reduce component wear rates. Anti-FUEL THEFT routines and alerting. 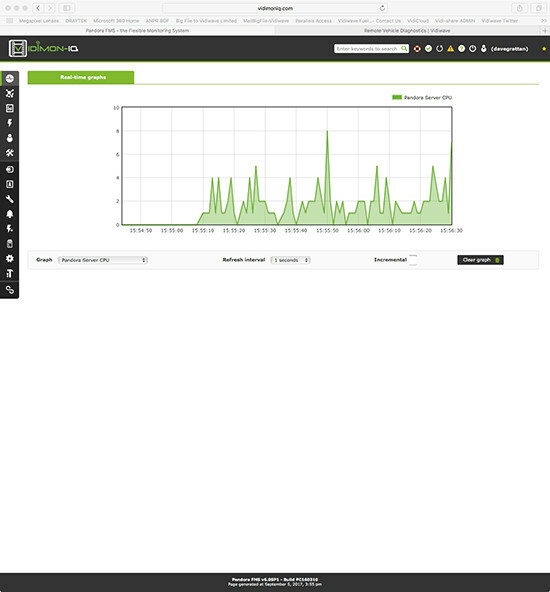 FMS1 - Real-Time CANbus statistics. FMS2 - Vehicle ID info. FMS7 - CO2 Emissions reporting. 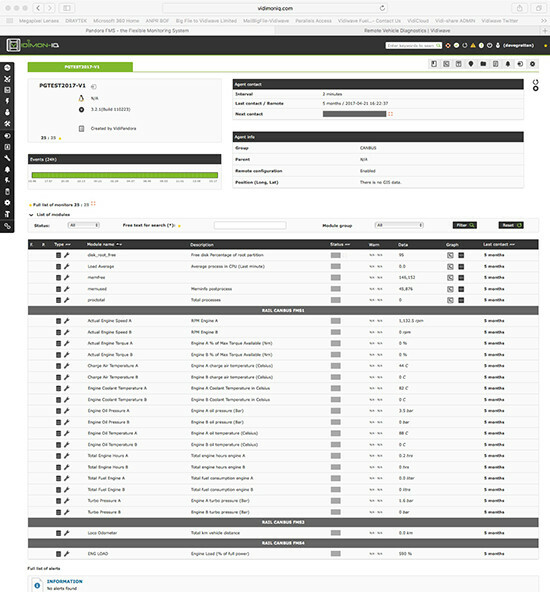 Vidiwave's CANbus diagnostics solution uses automatic collect and PUSH scripts to report real-time information via 3G to the clients VidimonIQ web interface. It also allows the end-user to define the condition alert level for each element of the CANbus information reported - to use this information as a proactive early warning system to identify vehicle reliability issues. Changes of condition are instantly reflected and report as either a Normal, Warning or Critical status as each element changes. 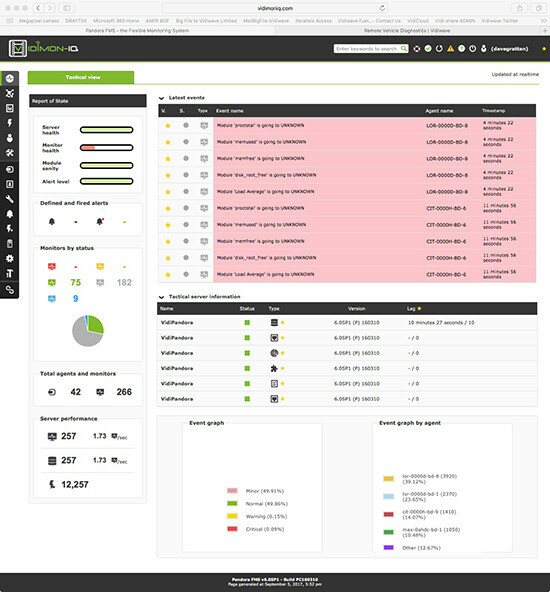 All alerts are displayed in real time and COLOUR CODED for instant visibility in the user console. It then automatically tells the Fleet manager about the problem using an automated distribution service to: the VCMS application ALERT box or the normal Email or SMS service provider. These same alerts can also be set up to email a nominated SERVICE and SPARE PARTS providers to effect a quick response and 1st time fixes. Review and analyse the performance of vehicles and drivers to obtain true life-cycle stats and help improve maintenance and service regimes. Produce automated monthly reports to discuss and review at engineering and management meetings. Quickly identify reccurring trends and in-warranty failures to address with suppliers.